You're off to a terrific start. 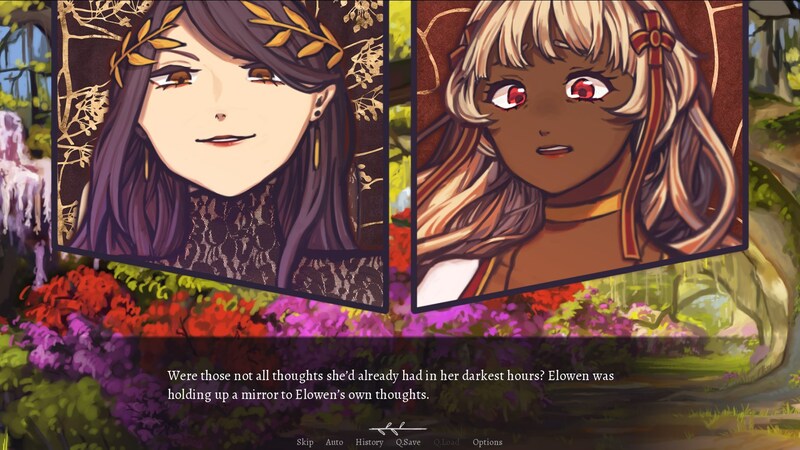 The slight but consistent changes to Elowen's expressions (especially the lips) is to die for and what really make a VN pop. Keep up the great work! I can't tell you how excited I was to see that this game updated!! I'm so glad that you are still working on it, and the new demo is really great - although the narrative didn't seem to change too much from the first (as I was hoping, it's a promising/interesting start), it's good that the choices become more dialogue-based. The visuals are beautiful and the story is so mysterious and enchanting. I can't wait for the full release! I love the artwork and the UI in the game. Nice work keep it up, I can't wait for more. Beautiful art, and I like the story so far! Can't wait to see what you have in store for us with the full version! This is a really beautiful game. I really like the art style, mechanics, portraits to indicate who is speaking, background, story arc, characters, and all the options in the menu you can choose from. When I first went through the game however I noticed the exact same as Crowthorne did about the limited options in choosing. It feels like you can only choose how Cassidy is feeling about events (I counted and you have only one option for different movements instead of emotions/feelings in the demo). What I also noticed is that the save system doesn't have an indication for the process of the game. Maybe you can introduce a percentage or day system or something. Anyway I am really looking forward to the game. Thank you so much for the feedback! We're working hard on the full version and I think there's some things that people will like! I will definitely consider the save system info - I'm thinking of maybe putting in playtime as a piece of info into the save slot? That being said, I'm not great at coding so I'm not sure if that's viable. Maybe chapter titles? Thanks so much again! I hope you enjoy the full release. Wow. I was REALLY impressed by this demo. The art is beautiful, and it's evident that your writer is well-read from the quality of the prose. I'll eagerly await the full version! Thank you very much!!! We hope you'll enjoy the full game as well! I really liked this. 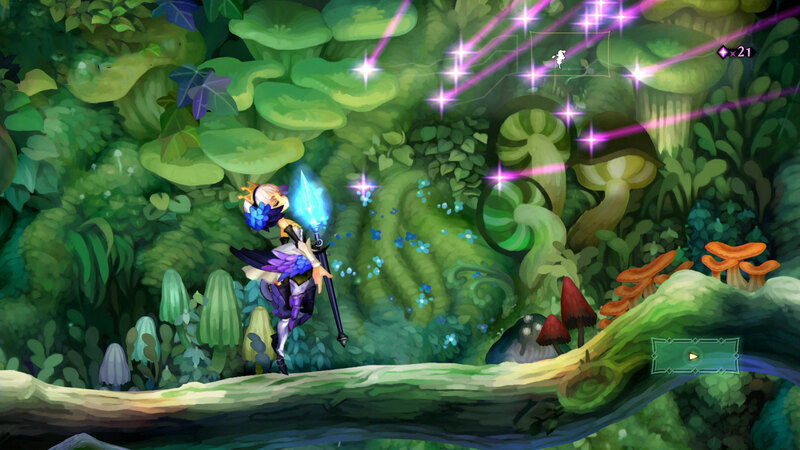 The music is quite beautiful and fits the tone of the game well, the art is gorgeous (the backgrounds remind me a little of Odin Sphere, which I haven't really played but was very impressed with the background art of when I saw it), and the writing is evocative and polished. The choices in the demo didn't feel that significant (a lot of them being what Cassidy thinks while doing the same thing), the first time playing through, but I did notice one of the earlier choices actually removing an option from a later choice, so I'm guessing the full game may have more significant ones. I wouldn't really mind playing what amounts to a kinetic novel that's yuri and looks this pretty, either, though. Either way, I'm excited to play the full game. I still have lots of questions, and the demo mostly just raised more. P.S. The in-game link to this itch.io page during the demo ending doesn't work, sending you to "https//l2.itch.io/wv" (missing a colon). Also, I think "Elowen's" here should be "Cassidy's"? Still a stunning level of polish, though. Thank you very much!!! It's really flattering to be compared to Odin Sphere wah ;o; Thanks for spotting the mistakes, we'll definitely snipe them for the full release! Lore is doing some pretty cool stats for the in-game choices and there are a number of significantly different endings! It's a short game but there a ton of variations, even in the demo alone. We'll try our best to get this released soon!